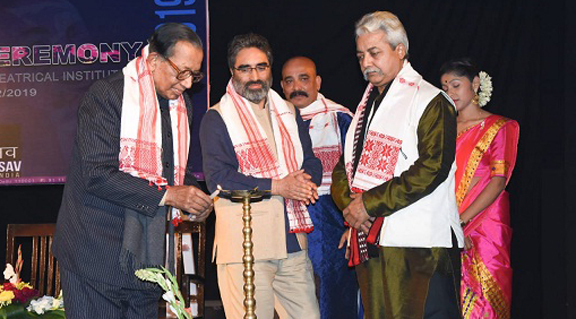 The 20th Bharat Rang Mahotsav on Monday was inaugurated by former president of Asom Sahitya Sabha Dr Nagen Saikia at India Club Theatrical institution here. The Bharat Rang Mahotsav is being organized by National School of Drama (NSD) in collaboration with India Club Theatrical Institution. In his welcome speech, Abdul Latif Khatana of NSD spoke about the Bharat Rang Mahotsav and how it is gaining popularity in India. “Theatre is alive because of people participation. We urge the people of Dibrugarh to come and witness the International plays,” he said. Dr Nagen Saikia thanked the NSD for organising the international fest in Dibrugarh. “It’s a proud moment for us because in entire Northeast Dibrugarh was selected for the international festival. Dibrugarh have a rich cultural history,” said Dr Saikia. The Assamese play ‘Bhou’ based on Assam agitation written and directed by Pranjal Kumar Saikia was staged in the inaugural day. The play depicts the Assam agitation. ‘Bhou’ director Pranjal Saikia said in 2012 the team Indipity was formed in Guwahati with a group of young and energetic theatre artists.